Border Banners & Join Us This Week for Garden Club! Don't Forget!!! Garden Club was changed to this week on Tuesday at 10 or 6 or Wednesday at 10. Hope to see ya there! We will be announcing the particulars for our Little House on the Prairie club quilt for 2016! If you haven't been in for awhile, you don't know about our Border Banners! These are very fun and easy. We have done them in the quilt-as-you-go method so you can make one in just a few hours. Really! They measure approximately 14" X 36. We have lots of Ackfeld hangers to choose from for hanging them. Cost of the kit is just $16.99 and includes the pattern. (Backing is not included.) Check out our website to see all of the different banners that are available. 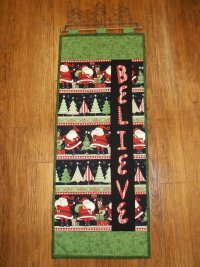 http://www.quiltersgardenonline.com/shop/Kits.htm There are 12 designs to choose from. These would make great Christmas gifts and you can even complete them in time for Christmas this year!